The Pacific Northwest is home to some of the most beautiful volcanic rocks and minerals on the continent, with a smattering of ancient tropical clays and fossil creatures from an ocean long gone. Join us as the summer kicks off for a women’s collecting retreat through the ancient geology of the Pacific Northwest. 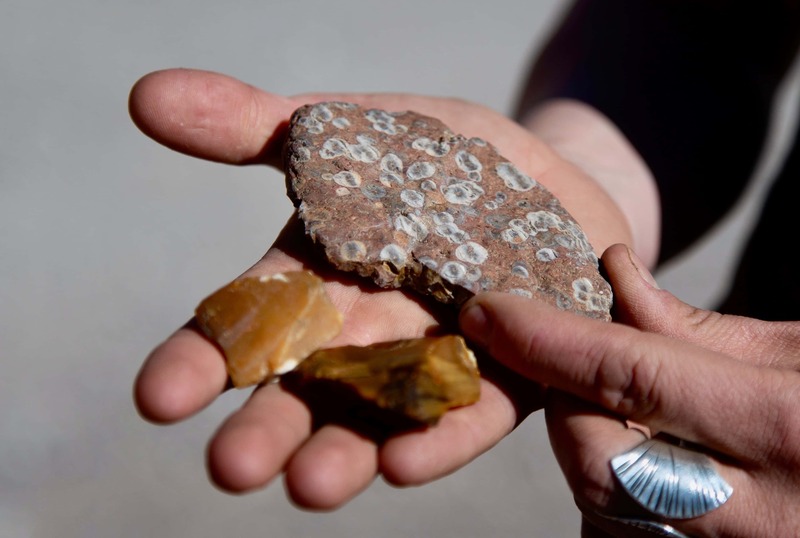 Rockhound, amateur geologist, and professional jeweler, Alison Jean Cole guides this expedition through collecting sites bearing agates, jaspers, thundereggs, and fossils. Each evening the group will examine the bounty from the day, sharing meals and camping together under the early summer sky. Alison will discuss the processes that heave the land upwards, exposing the treasures of geologic time, and how to identify the treasure-bearing sites and minerals within. This workshop meets in Maupin, OR. Students are responsible for bringing tents and camping gear. Dinner will be provided. All other meals are the responsibility of each student. This workshop is ideal for those who are comfortable being outside in all weather, including extreme heat, and are active, healthy and able-bodied. We will be hiking in desert conditions, and camping in unimproved wilderness areas. There will be no bathrooms or showers on this trip. A detailed itinerary and packing list will be provided prior to the trip.